Hardback. Reprint. An insight into the American gangs of the day by a man who had apparently been a gangster for 4yrs. 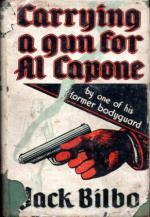 having been an Al Capone bodyguard, when he decided to write a book about his experiences. Jack Bilbo was not his real name, and he was only 24 when writing his book in 1931. Chapter headings include : Gangsters By Themselves; Bodyguard for Al Capone; An Attack on the Boss; Gangster Court; In the Beginning Was Colosimo; Capone's Press Agency; At Which Corpse Did We Stop? ; Blowing Up a Building; The Limits of Capone's Power; Storming a Prison; We Hold Up A Money Transport; Bringing In the Booze; Gangster Justice + much, much more. 160pp. 12mo. h/back. Browned edges, lightly foxed eps, Fade mks. to head/tail of sp. and lower edge corner, which corresponds to dw. loss. G++ in notched and torn Fair only protected dw.